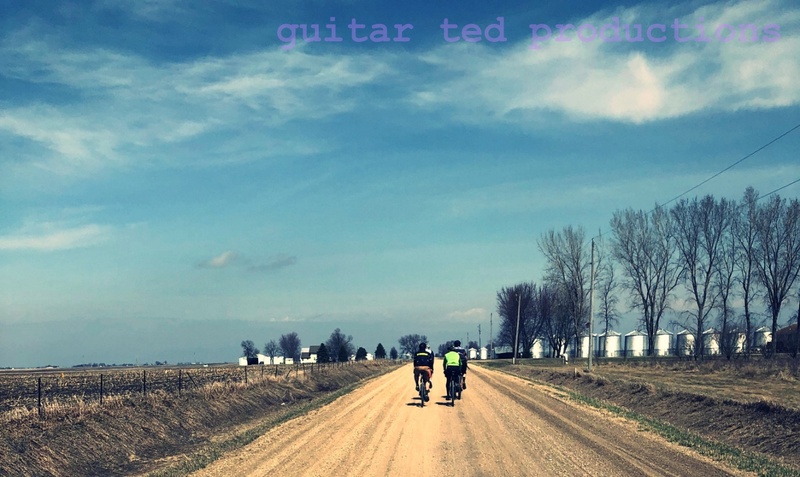 Guitar Ted Productions: Gravel Bikes: Canti Or Disc? Gravel Bikes: Canti Or Disc? Gravel Bikes- (well, assuming you even agree that there is such a thing), usually have cantilever brakes these days. However; that is maybe more out of convenience/necessity than choice. Cyclo cross bikes, for the most part, are cantilever braked bikes, and those bikes tend to dominate the gravel bike riding scene. But there is a big push for disc brakes in cyclo cross circles these days. (Notice- I didn't say just who was pushing for this.) So bikes like my Orange Crush BMC are sort of getting looked down upon. (See this post by BMC owner, Mike Varley on this subject.) However; for gravel races and riding, the disc brake is not a "slam dunk" idea. I want to give my thoughts on the matter here and maybe gauge your reactions in the comments to see just where everyone's minds are with regard to this. The argument for disc brakes is that they work better...... There are different ways folks will end that statement, but it always goes back to "they work better" than cantilever brakes. Okay, you might believe that, and say you know that to be "true", but I know a handful of guys that would tell you a different story. The story of T.I.V6 where several riders burned through their disc brake pads within 50 miles of the start and their cantilever braked counterparts rode onward. So, in bad weather, disc brakes are not necessarily the cure. In fact, they could be a disadvantage. Disc or canti? On gravel? There is also the concern for control. On gravel, that may mean having brakes that are not necessarily the most powerful brakes. As anyone knows, a wheel that is skidding is a wheel that is out of control, and on the ball bearing-like surface of most gravel roads around here, you want to be very, very careful when using your brakes on high speed descents or in corners. It is super easy to skid on gravel, and losing control could mean that you may pay a big price in skin and machinery out there in the countryside. Finally, I have to wonder what one will sacrifice in ride quality with a frame and fork set up properly for disc brakes. Looking at what is being offered up for cyclo cross bikes with disc brakes, I am seeing a beefed up construction, that maybe is heavier, or not, but more importantly, needs to be stiffer. This is especially true with the fork design, since the forces at work on the fork are entirely different than with a cantilever equipped fork. Maybe I am wrong here, but I can't see how one can get a disc brake fork on a gravel bike that is reasonably light without sacrificing ride quality. Maybe looking at things backward would help with my viewpoint. Say disc brake road/cyclo cross bikes came first. Then some guy invented a cantilever braked gravel road bike. It was lighter, had a more compliant fork for better ride quality, and sacrificed little to braking performance on off-pavement riding. What would you rather ride? I know disc brakes are coming, and disc brakes "work", but at what cost? Hmm......and then maybe I'll be proven wrong, and some designer genius will get disc brakes on there and have greater rider comfort than my BMC bike. Maybe. I'm skeptical, but I'm not against disc brakes if they don't "harsh my ride". What say you? Hit up the comments and let's hear what you think out there. This post reflects my exact thoughts after reading Mike's post. A well-tuned disc is better than a poorly tuned canti, and vice versa. Discs have a lot of valuable uses, but big open roads may not be one of them. I've been served fine by canti's on my CX'er,which is my "go-to" bike for gravel or pavement (and occasionally for trail-though it's the only complete trail worthy bike I currently have,my mtn bike loaned parts to another project)...however,I have been served very well also by discs on my mtn bikes,which I ride gravel on occasionally. Tough question. I rode a Salsa La Cruz Disc Cross bike in T.I.V.6. There was so much much cake into those BB7's that I completely lost braking. The Clayish mud took all the material off the brake pads leaving me with metal to metal. My friend Dan Opened his cantis, cleaned them and kept riding. I also don't see the need for so much braking power. Basically you are going in a straight line. If you bomb a hill most likely the awaiting uphills is going to slow you down. I think they are over rated and just another marketing hype. Good thought's Mark. We don't have much "gravel" out here. Instead, we have all these fire roads and trails that go up and down and up and down. Lots of braking required. I've found that a well set up canti brake has plenty of stopping power and modulation. I think there are two types of folks that may determine if you are a canti or disc person. The hard charger, pedal to the metal rider probably goes for the disc brake. The smooth, effortless looking even when they're going all out would be more in the canti camp. Anyway, it's great that there are all these options out there and it's easy to find a disc bike or a canti bike. Cantis for me. I find it easier to modulate Cantis than discs... although that could just mean I'm ham-handed. Still, I've used both and prefer the cantis for sure. I'm a big proponent of Canti's/V's/Mini V's. I raced cross exclusively on Canti's and they worked well once set up properly (which really isn't hard to do). The only thing I really like about disc's is that the rims are not used for braking. I'd much rather replace rotors. However, I haven't really had an issue having to replace rims frequently, even when riding in muddy/gritty conditions. Canti's will always remain tried and true for this type of riding. I just deleted a very long post and am simply going to say that I ride discs 100 percent of the time. I just hate to see a good supple fork get stiffened up right where it should be flexing. And now add in the tapered steerer tubes? It's not bad enough having a skinny tire to begin with? There is one special exception, though - when the weather is in that slush/freezing transition and your rims ice up. Then I start thinking about discs again. I tend to agree with GT's comment that "disc brakes are coming" for road/cx. Whether they are ultimately proven to be superior or not, I think that they will sell bikes. I agree with Rob that, for mountainbiking, disc brakes are great. My main complaint with them, and a factor that would have me avoid them for road/gravel grinding etc, is noise. This may be a minor worry for trail rides, but on longer gravel rides is mentally tiring. Lastly, I just wanted to mention wheel strength. All else being equal, a disc hub wheel with dished spokes and narrower flanges is not as strong as a symmetrically spoked, wider flanged rim brake wheel. I assume that this is more pertinent on a gravel grinder wheel running 35mm tyres as opposed to mtb wheels with 2''+ of rubber and suspension. I would ride that bike. I recently built up two bikes with mechanical discs, a cross bike and a touring bike. In my opinion disc brakes are simply different in that they are a collection of disadvantages and advantages. They aren't a "slam dunk" and I don't have a strong "never going back to rim brakes" opinion about them. In my mind they are a setup choice, as you mentioned they come with some trade-offs just like tire choice, etc. mechanical models. The excellent rim brake choices we have now are the result of years of refinement yet it seems that industry focus is on getting hydros working inside integrated shifters. Is it too much to ask for less 'setup orthodoxy' (discs or bust) and more quality choices? @avanderlip, I agree with you basically, but will say that for the most part, I have no need to go back to rim brakes. Basically, I like having ubiquity in wheels, so I can swap my five 100/135mm disc wheelsets among both my gravel grinding bikes (which both run discs) and my mountain bikes. So, if I want to set my Vaya up with the Crossmax wheelset with tubeless 35c Schwalbe tires for an event, I've got a super light set of race wheels for it all ready to go. How dedicated you'll be to switching is all about your priorities, your parts collection and your experience. My experience leads me to discs, but your mileage may vary. I understand that. Why don't we post a good article on setting up Canti's the right way and then do a comparison. I run Mafacs from the 60's with koolstop pads and never touch them. I guess the Pauls are great, so are others. I think Avids dont work that great. Anybody?? @Ari: Great idea! My BMC cantis are actually old Shimano STX mtb ones from the mid-90's. I am comfortable with setting those up and mine don't make a peep while working just fine. Meanwhile the various Avid disc brakes I own run the gamut from consistently noisey to dead quiet with great modulation. It depends on set up/components/frame they are on. My point is that the disc brakes are just as difficult to set up correctly as cantis are. @ Ari - I found my Tektro 520's (I think they're called CR720's now) super easy to install and adjust. They are nice and strong and I haven't had to adjust anything in ages. It has discs (obviously), and I wouldn't give them up for the world. In fact, disc brakes were a prerequisite for me, as I looked at the build. In part, it's because I was wanting a multi-purpose bike. Something I could throw panniers on and camp or commute, something I could do winter training on, something I could ride gravel on, something I could (passably) do CX on. It has been all that and a bag o' chips. It took me a good year to learn the nuances of the BB7s, and how to set them up for the magical compromise of quick reaction and no drag. I've put them through chest-deep water, mud that packed the whole frame, snow over the bottom bracket, gravel up the yazoo, and just about every other possible adverse condition out there. On one ride, I had some small rocks get caught in the brake, which required a quick cleanout during the ride. I've seen friends have that same issue with Canti brakes. For me, the stopping power and consistency is such that I wouldn't go back to Canti brakes. I ride friends' well-set-up Canti braked rigs (like Tobie's canti La Cruz) and don't envy it for a second. Disc brakes are here to stay. While my Vaya is obsessively cleaned and used on the flats of Illinois, in the several thousand miles I've put on it, it has required precisely one set of brake pads. As GTed notes, the coming wave of road/hydro disc setups is exciting. I think that will solve one of the existing drawbacks of BB7s, which is the need to tweak adjustment with some frequency. I think a second improvement would be the creation of a plastic cap to go over the outside of the brake caliper, to keep mud/gravel/crap out. If it popped on and off easily, it would be a boon. I have NEVER had a problem with crap sticking to the rotor and getting tracked into the brake that way. In my experience, crap falls off the tires and finds its way into the hole on the top of the caliper that the pads go in through. Anyhow...there's a place in this big world for both types of brakes. For me, disc brakes were a key component of versatility--which is why I went with a Vaya. If I was building a pure gravel race bike, I would likely still look for disc-compatibilty. Going back to something I had blogged about a couple weeks ago, it seems like there are getting to be 2 types of gravel events...the duster events where skinny/fast rules, and the slog events where fat/mud clearance rules. Perhaps those different types of events have different prerequisites for equipment. @lawfarm: As I stated in my post, I also use a disc brake equipped bike on gravel a lot, (Fargo), but my point is, disc brakes are not necessary for gravel road riding/racing. Hydraulic brakes may solve some of these issues, but again, my take is that it is overkill for gravel riding. Not that the disc brake thing shouldn't happen. I know it will eventually. It'll be fun to see what they come up with too. "Why don't we post a good article on setting up Canti's the right way"
I had always thought disc was THE hot setup and never gave much thought to going back to rim brakes until reading this article. There has always been a very progressive feel with my BB7's to the point of pure confidence. Well, it happened. As I hit a downhill left hander on my last ride, for some reason my rear grabbed abruptly, puting me into a full lock slide. How I avoided a highside is beyond me! Now for the first time ever, I am rethinking my next gravel dream build. I've got two bikes I use for gravel. a kona jts with cantis and a salsa fargo with discs. both work well. I rarely consider brake choice when deciding which bike to ride. tire width, bike weight, and bottle count are more important considerations. both bikes are great on gravel. the salsa is a little more rugged being a mt bike. The thing I feel may make a difference to some folks here is weight and ride quality. No one is arguing that disc brakes wouldn't/don't work, but the consideration is for what allows for the lightest, most comfortable set up with brakes that do work. I think many would say that would be cantilevers. I'm not sure about gravel, but for "do it all" bike, based on cross-like frame, hydro disc is a "must have". Cheap, reliable, almost no maintenance at all, simple models do not even have any adjustmens, you just put them on the bike, and this is all. For me, mechanical disc brakes is something like abomination, combining flaws from rim brakes and disk brakes in one, surprisingly popular product. So, with dropbar, if I go singlespeed, I will use v-brakes with Tektro RL-520 levers. And if not, there is no choice at all, but to use cantis, since only cantis work with STI shifters. Now I am waiting for Surly to finally made a Cross Check with Troll/Ogre rear dropouts. Because there is no disc alternative to original Cross Check, except Origin8 Cyclocross frame, but it is ugly. I can't change CC to ugly bike. I ride gravel because I'm an outdoor guy. I think most guys riding gravel ride all year round. Disc brakes far exceed canti's in wet/ice. If I'm going to have a summer gravel bike ok. If I'm going to have an all season gravel bike it's disc brakes. Bigger Must Be Better, Right?